I am in Telluride this weekend, mainly to visit Cody’s grave and acknowledge the 5-year anniversary of his passing, but also for some R & R. I am exhausted, and the first day here I slept and slept. I am lucky to have discovered where to go when I really need to rest. The San Juan mountains, home of my ancestors on my mother’s side, provide me with a spiritual renewal I get nowhere else in the world – not a beach, not a Greek island, not a Catholic church, not anywhere else. My mother was born and raised here, when it was a mining town, not the ski resort it is now, and I feel deeply connected to this beautiful place, even though I grew up 120 miles away in Grand Junction – it’s landscape is much different. 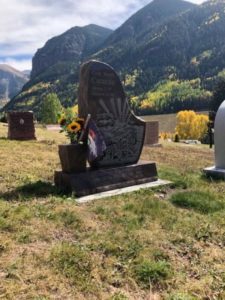 The jagged, steep mountains in Telluride are like nature’s church, a place of healing for me, and it’s why I buried my son here. It could quite possibly be the highest and most beautiful cemetery in the country at 8,800 feet – it’s called the Lone Tree Cemetery. I found a place to stay, not too far from my old house (I owned a home for 20 years and lived here full-time for almost 4 years), where I can look outside and see the majestic mountains I love so much. I come here not only to slow down and feel Cody’s presence, but the presence of God, too. God is in these mountain tops. 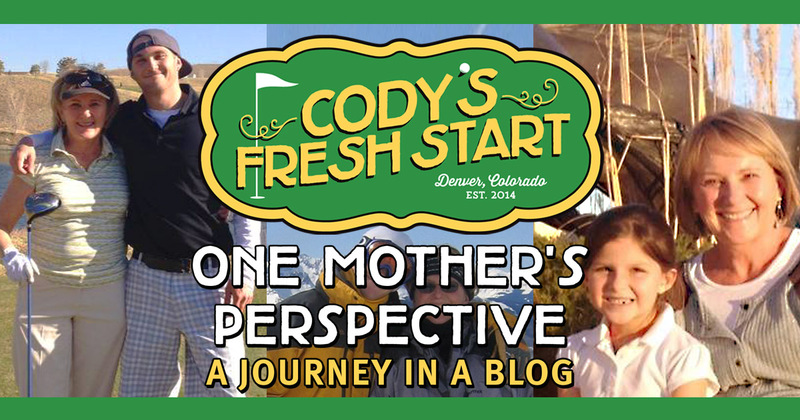 In the first couple of years after my son died, I felt his spiritual presence often, wherever I was, it didn’t matter, he was always with me, but lately he has become less and less present. In fact, over this past year I have felt him the very least. Maybe it’s normal, since it has been 5 years since his death, that I don’t feel as close to him, but perhaps it’s because I have made the choice to be so constantly busy I am numb to the pain, and in that numbness, I can’t feel his presence. Is it possible to strike a balance between doing the meaningful work I love to do, and at the same time stopping to feel the presence of my son, which at times is painful? I sense the answer to this question is a bit complicated. I never thought my only child would die before me, and I would end up alone in my sixties, but here I am without any children or a spouse. It’s certainly not the life I imagined for myself, but I keep thinking there must have been a different plan for me. I am not a typical, retired lady walking her cute little dog 4 times a day, like my neighbor ladies do. Yet, I long for those ordinary, simple things in life, and I envy them at times. I doubt their reality includes a son who overdosed on drugs or the loss of an almost 30-year marriage. I am jealous that small talk is easy for them and difficult for me. Losing a child destroys the ease of small talk. I guess I’ve been dealt a bad hand, but I feel I’m not meant to fold. I can’t fold – it’s not in my DNA. I feel the need to take this bad hand I’ve been dealt and ask for a new one. Sometimes I win and sometimes I don’t, but I am willing to take that chance. Sometimes I burn myself out and sometimes I realize I need to stop and slow down to feel my emotions. I have turned into a gambler of sorts these days, maybe in order to find meaning in my son’s death or to survive the intense grief. I am aware I need to forgive God for dealing me this bad hand – for the most part I have, even though I still find it difficult to go to church. I need to feel my emotions, notice my pain is still there, and accept my life is different than most folks my age. It’s okay to be who I am and accept not only what has happened to me, but who I have become because of it. Everything, including me, is permanently different. I imagine grief to be a universal truth, not necessarily beginning with me, but finding me when my turn came. I am not special in this grand scheme of things – just a part of the uniqueness of each individual human experience. I don’t believe in fate, but then again, I do. I don’t control all things, nor do I want to or know the ultimate outcome of them. I will leave that up to the Universe or God or a Higher Power. I am just trying to get through each moment at a time, some are pleasant, while others are not. In my awakening, I get to experience the privilege of feeling my son’s presence and it is what I want. I want to feel the pain of losing him, because I lost the deepest love I’ve ever known, as every mother who has lost a child knows. I don’t want to be numb to it, and I don’t want it to be destructive, either. Becoming numb to the pain is not an option and neither is sitting around feeling sorry for myself. I strive to find that balance between the two – meaning and pain. Each step toward meaning helps to relieve the pain, but it doesn’t eliminate it, and I don’t think it’s supposed to. I can see how tragedy holds the seeds of grace and what brings me to grace is not always enjoyable, though it seems to take me to something essential in my grief process, if I stop long enough to feel it. Mary, this poignant post fills my head with so many thoughts. If I were to I say I can’t imagine your pain, it’s not entirely true. When my daughter was in the height of her using, I started to think about her death because I had thought it was inevitable. I thought I needed to prepare myself. I began to grieve even though she was still alive. Every single day of my life I thank God for helping her find her way out of the addiction. Just as God had a plan for her, He has a plan for you. My heart hurts reading your words. Mary, I am in awe of your strength and your commitment and determination to help others. Thank you for what you do. Mary you are such a powerful force and I never really believed in fate until Matthew met you and Jackie. I know God put you in Matthews life and in turn our whole family has received the benefit of your amazing strength and courage. There are days that the pain is so unbelievable. I really keep thinking this big hole in my heart will start to get smaller but it has not happened yet. I really cannot believe it has been almost two years since Matthew died. What you do is so big and so much appreciated by so many. I know Cody and Matthew are watching over us. Thank you for all you do for so many all your hard work is so appreciated.